Rasam is very common in all South Indian homes. We make different types of rasam and this mint (pudina in Tamil) rasam is one of them. It is very flavorful and easy to make. This rasam does not need rasam powder. It is the mint, peppercorns and cumin seeds which gives flavor to the rasam. I used homegrown mint leaves to make this rasam and my whole house smelled like spa. 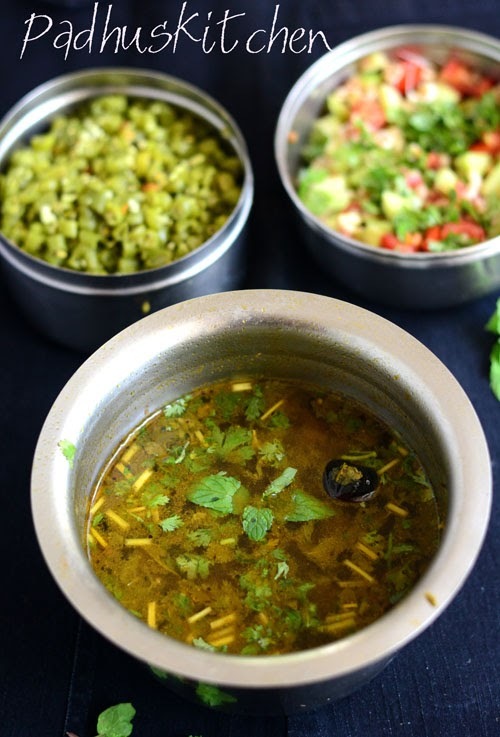 Today we will learn how to make flavorful mint/pudina rasam/charu using our easy recipe with step wise pictures. Dry grind or powder whole black peppercorns and cumin seeds slightly coarse. Keep it aside. Grind fresh mint, tomato (1 tomato and another 1/2 of a tomato, the other half, we will chop and add it to the rasam) and tamarind to a fine paste. Heat a tsp of ghee or oil and saute the paste until the rawness of the paste goes. In a vessel, add a cup of water, turmeric powder, 1/2 of a tomato (chopped), pepper-cumin powder, salt, curry leaves and the sauteed mint + tamarind + tomato paste. (If you are using a kadai or any pan, you do not have to saute the mint + tomato paste separately and add. You can saute it directly in the pan/kadai you are making rasam, then add water, turmeric powder, chopped tomato, pepper-cumin powder, salt etc). Boil for 5-6 minutes on medium heat. Add 1 1/2 cups of water. When froth starts forming on the surface, switch off the rasam. Do not let it boil. Add finely chopped coriander leaves. You can also use the tender stems of the coriander. Heat a tsp of ghee, add mustard seeds, cumin seeds and red chilli, when it splutters, pour it on top of the rasam. Garnish with finely chopped coriander leaves. Enjoy it piping hot with rice. If you are interested in growing mint at home - check my post on how to grow mint at home.